Inspired by the spontaneous compositions of landscapes, Dan Werstuk depicts his ideas through the expressive medium of soft pastels which allows his subject matter, creativity and dexterity to create a poetry within simplistic boundaries. Like most artists, I’ve used the traditional art mediums such as oil, acrylic and watercolour. It wasn’t until I saw a number of contemporary paintings in pastel that I moved toward that medium. The richness and purity of colour caught my attention and I saw the possibilities. The first painting I did in pastel was a winter scene of a bridge over the Black River, a fishing spot that was a favourite of my father-in-law. In making that painting I learned a number of lessons. Pastel is a forgiving medium. I can stop and start painting any time as there’s no waiting for paint to dry. It’s a dry medium with colours that can be blended and manipulated on the surface. I can lay light colour over a thin layer of dark without the two mixing. It was a eureka moment: I had found my medium. Within a short period of time I was able to achieve the kind of representational painting to which I aspired. Garden scenes and wildflowers, antique boats built in Muskoka and scenes taken from travels with my family have all made there way onto my easel. I grew up in Gravenhurst on Lake Muskoka just up the bay from where many of the wooden boats were made. Some of those boats are antiques now and you’ll still see them throughout the summer cruising up the lake. The warmth of the wood, the brilliance of the chrome, flags waving and the waves abstracting the reflections make for dynamic compositions. I will often sharpen the edge of the pastels to get those fine details. The details take extra care and much more time but I love painting them. 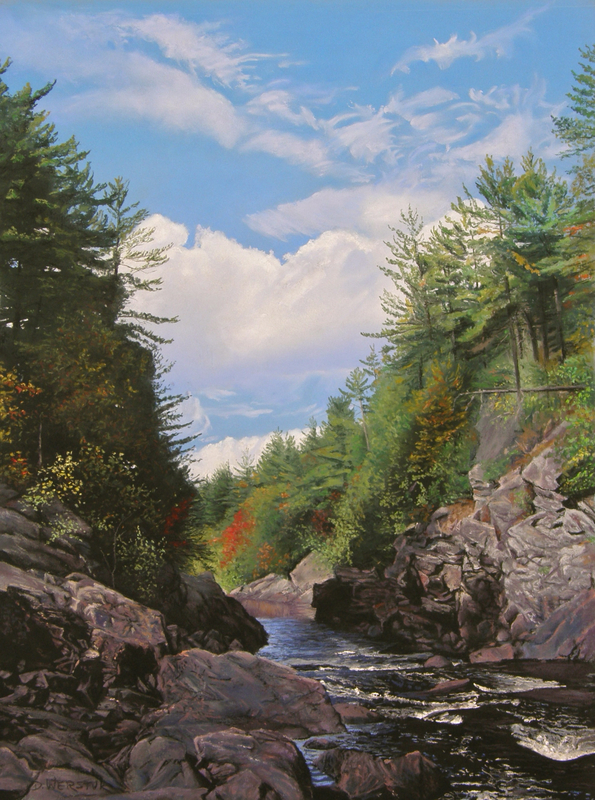 Algonquin Park has been the source of inspiration for most of my painting. The magic of rising mist, glorious sunrises and sunsets, waterlilies, their stems disappearing into the depths are some of the images that I like to present. I’ve been told that a lot of my paintings have a calming effect or meditative quality. I like to think it flows from the great appreciation I have for the northern Ontario landscape.